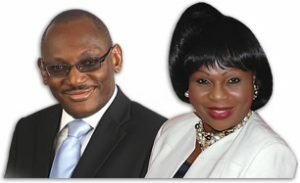 Pastors (Dr.) Olubi & Dr.(Mrs.) Sarah Johnson founded Lifeforte International Schools on the 5th of November 1990. Olubi Johnson is the Chairman of the Board of Trustees of Lifeforte International High and Junior Schools, Biscordint Travels, Lifeforte Holdings and Investments and is the Nigeria Master Affiliate of the Linux Professional Institute (LPI), the first and largest vendor-neutral Linux and Open Source certification body in the world. He is also the President of Christ Life Ministries and Co-founder of Scripture Pasture Christian Centre, Ibadan, Nigeria. He holds a first class Bachelors and Masters degree in Physics from the University of Ibadan. He is also an alumnus of Imperial College London where he completed postgraduate coursework in Communication Engineering. His love for the challenge of research in cutting-edge Computational Theoretical Physics led him, after many years of fruitful ministry, to return to his passion for academic research and attainment, and was recently awarded a PhD. in Physics from the University of Ibadan for his dissertation entitled: “Atomistic Simulation and Calculation of Optoelectronic Properties and Efficiency of Graphene-Anatase Based Magnesium Perovskite Solar Cell.” With over 25 years of experience in education and management, Olubi continues to ensure that Lifeforte stays true to its mission of enhancing lives via excellent education. Sarah Olubi-Johnson (B.A., M.A., Ph.D.), by the grace of God, is at the heart of the divine success story that is Lifeforte International Schools. She is a woman called to serve; with excellence as her watchword and a passion for education and the future of Nigeria. Born on the 30th of August 1960, Sarah is the first child of HRH Dr. K.A.O Sansi, the Obelu of Esure and the late Olori Damiana Taiwo Sansi. She attended the prestigious girls’ secondary school, St Anne’s in Ibadan and then proceeded to the University of Jos where she graduated with a Bachelor’s degree in English (Second Class Honours Upper Division) and proceeded for her Masters’ degree programme in the University of Ibadan where she specialized in phonology and earned a Ph.D in English. Sarah lectured in the department of English, University of Ibadan, from 1984 to 1991. Sarah left her lecturer post to pursue her passion for children and youths, which motivated her to establish Lifeforte International Schools and has, by the grace of God, evolved to become one of the leading primary and secondary schools in the nation. What began as a Day-care Centre has, like the proverbial acorn, grown into a mighty oak with its branches spreading to and having an influence that spans three continents; Africa, Europe and North America. Lifeforte International Schools offers the Nigerian, British and American curricula. It consists of Day-care, Pre-school, Junior and High School (O’ and A’ levels) for children between the ages of 3-18 and is an answer for parents searching for world class, Afro-centric education that would place their children on a platform to achieve great heights. Situated on an expansive 25-acre estate, the ultra-modern campus contains well-equipped classrooms, science laboratories, state of the art ICT facilities, an art studio, an extensive library, ‘home-away-from-home’ hostels, gymnasium, and a world-class sports complex, providing students with a best-in-class holistic educational experience. The faculty and staff team consist of a diverse group of seasoned academicians, chief examiners, and leading professionals, many of whom are leading educational authorities in their different fields of discipline. A member of the Council of International Schools (CIS) and the Association of Christian Schools International (ACSI Global), Lifeforte is recognized as one of Africa’s foremost private, junior and high school establishments whose ultimate goal is to equip its students with a Godly heritage and a competitive edge that is necessary to initiate “landmark lives” in future. Lifeforte is an academic institution that is committed to excellence. We recommend any of our students with the utmost care and confidence in their academic abilities and personal qualities as excellent, focused young people with great potentials as future leaders. Extra-curricular activities such as leadership training skills, human rights skills, moral instruction, societal ethics, public speaking, sportsmanship, and community development contribute to the wholesome development of Lifeforte students. This coupled with a strong academic tradition makes Lifeforte students rank among the top 1% of African school children. 100% of the students fielded for the university of Cambridge ‘O’ level and ‘A’ level examinations pass and 95% achieve A*-B ratings on a 6-point scale. Every year, Lifeforte students gain admission into top League universities in the UK, USA & Canada. Sarah’s open door policy, motherly affection, benevolent nature, indomitable spirit and love for children and youths are some of the qualities that endear her to children and youths and earned her the name “Mummy Sarah”. She is often heard saying that, “When you train a child and inculcate in him a sense of excellence, of aspiring to great heights, of making an impact in the world around him in any field of endeavour of his choice then you are building a strong nation”. The mindset at Lifeforte is that African Initiatives can be great. As a fully African initiative itself, Lifeforte International Schools seek to optimise greatness in all their dealings. Lifeforte students are constantly encouraged and challenged to maximise their potential in order that they might be great and contribute to the development of Africa and the world at large. We have a mission to catch young minds from the cradle and nurture them through the precarious age of adolescence, where they will know the difference between good and evil, and have the strength of character to choose good. Consequently in Lifeforte International School we inculcate a new mindset in our youths to pull down strongholds of race supremacy, fill the valleys of superiority and inferiority complexes militating against us as a black race, straighten the crooked paths of lack of confidence and inadequacies, smoothen the rough paths of wrong mindsets, lack of liberty and true identity, soaring and aspiring for excellence and greatness. Sarah Johnson has won several accolades most notably the PSR Woman of Merit Gold Award, Leadership in Nigeria Education Gold Award, Grand Award for Productivity in Africa and a nomination for the TimeNews Development Acheivers Merit Gold Award. She is an astute businesswoman and has successfully managed a number of businesses, including Biscordint Travel Agency and Tours, Right Choice Group of companies, to mention a few. Sarah is a woman with great depth and insight into the word of God and has a tangible prophetic grace upon her life. She ministers as a pastor in Scripture Pasture Christian Centre where her husband, Olubi Johnson is the Senior Pastor and they have four children. Her love and commitment to excellent education for the future generations of Nigeria and Africa continues to be a source of inspiration to many throughout the nation and continent as a true mother at heart to youths.